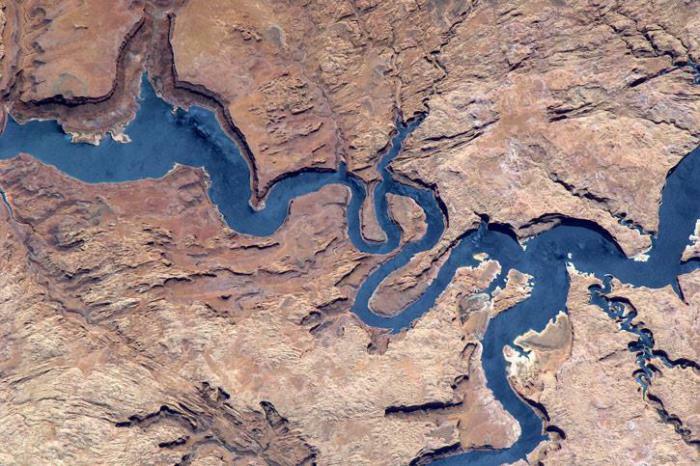 Was the Grand Canyon Caused by a Global Flood? Was the Grand Canyon carved by a global flood? There are a lot of ways to debunk this myth. One is to look at the photos attached to this post. That’s the Colorado River winding its way through the Grand Canyon. See all those lazy “S” curves? That’s what slow moving rivers do over long periods of time. We see it everywhere on the planet. Keep this in mind as you read, please. Now think about the Grand Canyon. It’s almost 300 miles long and around a mile deep. In spots it’s as much as ten miles wide. A rough estimate of the volume (how much rock it would take to fill the canyon) is 386,115,840,000,000 cubic feet. If you were kind to the global flood believers and assumed the entire canyon had been filled with light sandstone having a density of 2.8 g/cm3, the total amount of rock that would have to have been immediately gouged out by the flood would have weighed an amazing 33,746,194,212,283 TONS. That’s over 33 TRILLION tons of rock in one fell swoop. And we’re assuming the rock is sitting there loose, waiting to be moved — which it isn’t — it’s bound to the surrounding rock. This is supposed to be a non-technical discussion, but for those of you who remember high school physics, think back to Newton’s First Law of Motion: a mass at rest will stay at rest until it encounters a force great enough to move it. Over 33 trillion tons of rock. You just can’t get water moving fast enough to do the work, so the discussion should really stop here. Remember that picture of the canyon? Those slow, twisty “S” curves? Now, think about flood water moving at impossible speeds. Or just think about flood water moving at possible speeds. It flows FAST. And what does our magically-fast moving flood water do? Remember those “S” curves? The ones cut by slow moving water? Aha! So at this point you have to choose: was the flood water moving fast enough to move over 33 trillion tons or rock, or wasn’t it? If it was, then it cut a straight line. If it wasn’t, then it slowed down and couldn’t cut a 300 mile long channel in solid rock. The Grand Canyon was carved over a very long time, slowly, as the Colorado River twisted its way through, eroding the rock, grain by grain, as it’s still doing today. At this point, creationists will inevitably bring up Mount St. Helens, the Washington volcano that erupted in 1980, killing over 50 people and cutting a “miniature Grand Canyon” in the process. The first thing creationists are forgetting/ignoring is that Mount St. Helens cut its “canyon” through loose volcanic ash and dirt, not rock. That’s much, much easier. The second thing creationists are forgetting/ignoring is that Mount St. Helens is approximately 100,000 times smaller than the Grand Canyon. Using a 1/100,000th specimen cut in loose ash to as a model for a 300 mile long, mile high, 10 mile wide canyon cut from solid rock isn’t very good science. But in the context of this article, perhaps the most important thing creationists are forgetting/ignoring can be best illustrated by comparing the photo of Mount St. Helens (below) to the photos of the Grand Canyon elsewhere in the article. 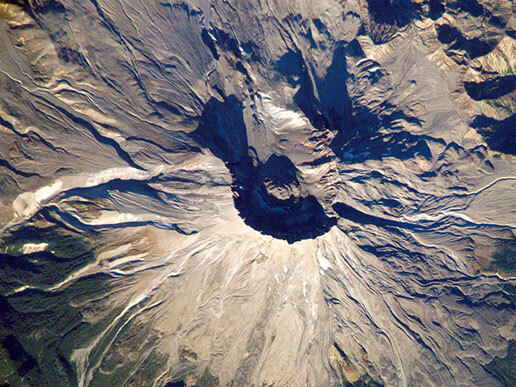 See all those straight lines cut by fast moving debris on Mount St. Helens? See all the S-curves in the Grand Canyon?. In a future post, we’ll look at the idea that the canyon wasn’t solid rock when the flood came. Believe it or not, there are people pushing the theory of a 300 mile long, one mile high, ten mile wide wall of mud. No, really! (All images courtesy NASA. Used with permission).